With asparagus still growing full throttle in the garden, it was time to find some new ways other than a simple steam and light dressing of olive oil and vinegar to eat the vitamin E-packed, spring veggie. That’s when I came across a pasta recipe lying around in one of my old Vegetarian Times magazines that called for roasted asparagus. The vibrantly colored photo sold me, and thus led me into the kitchen to get working on an adapted version of the recipe. 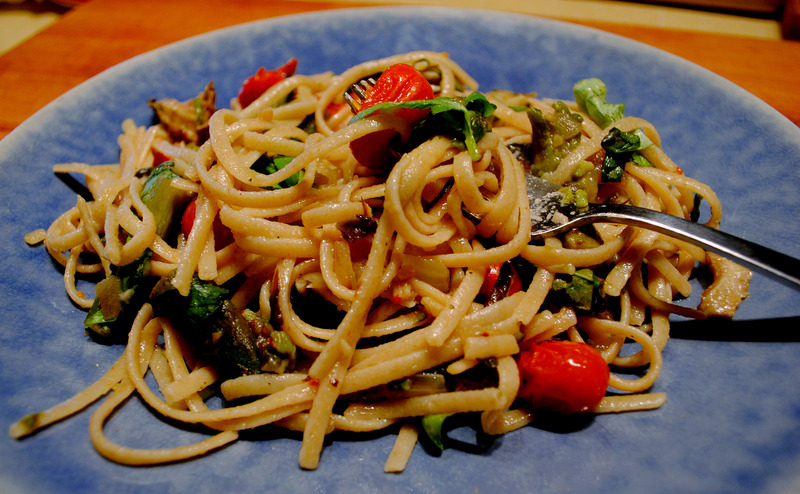 I used whole wheat linguine for an extra punch of fiber, containing a nutty flavor that wasn’t too much for the bold tastes of the wonderfully combined featured ingredients— roasted asparagus, shitake mushrooms, garlic, and cherry tomatoes, and then topped off with garden fresh basil. The result: A colorful palette on my plate filled with a touch of sweetness from the garlic, a lightness from the oven-bursting tomatoes, freshness from the basil, and a sense of satisfaction from the hearty pasta and newfound way to utilize asparagus. If you’ve got asparagus still growing in your garden or being sold at the local farmer’s market, this is a must try. The following recipe was modified from a Vegetarian Times February 2010 recipe. Preheat oven to 450F. 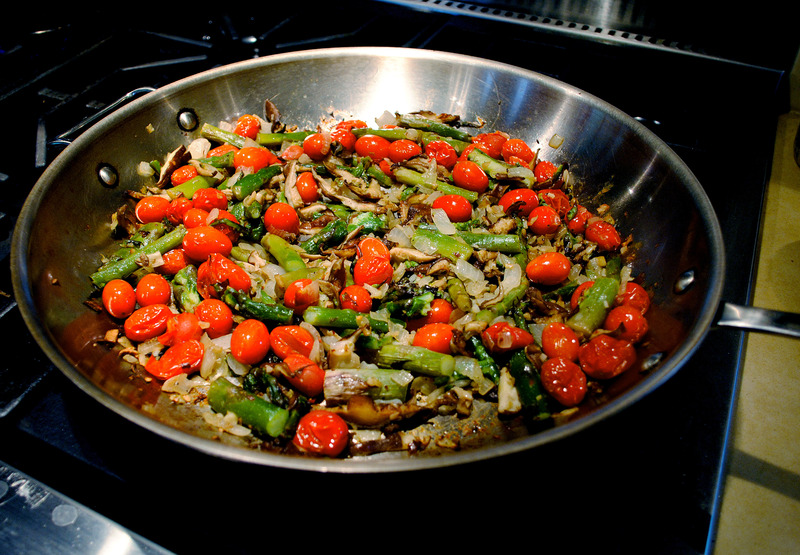 Toss together mushrooms, asparagus, onion, garlic, oil, and red pepper flakes in a large roasting pan. Roast 20 minutes, stirring occasionally to prevent sticking. Add tomatoes to pan and roast 7-10 minutes, or until tomatoes begin to burst open. Transfer vegetables to a separate bowl, and generously sprinkle with salt and pepper. Place roasting pan on burner over medium heat, and add wine, stirring to scrape off any stuck-on bits from pan. Simmer for 2-3 minutes, or until wine has evaporated by half. Meanwhile, prepare pasta according to package. Drain pasta and reserve 1/2 cup of cooking water. Stir reserved cooking water into the wine in the roasting pan. Return pasta to pot, and add wine and vegetables. Toss over medium-low heat until heated thoroughly. Season with salt and pepper, to taste. Stir in torn fresh basil leave, and serve immediately. imagine if you made your own wholewheat linguine to go with this. That looks amazing – so colorful! I love roasted veggies – especially asparagus! Yes, I agree, super colorful! This dish looks perfect. I love simple and light pasta dishes. Great use of whole wheat pasta. This looks really good! I like asparagus but never think to buy it. I made your Rhubarb Crisp the other day and mentioned it on my blog (http://livinlovinlearnin.wordpress.com/2010/05/28/10k-training-plan-and-rhubarb/). It was delicious! Holy Yum! that looks so good! I LOVE roasted veggies! Great dish, colorful dish! How beautiful! I can’t wait to try this using some our fresh basil (we just planted our first herb garden). Our family loves pasta that is made from Kamut Khorasan Wheat and this will be great with all the roasted veggies. Looking forward – thanks!